Let's talk about the elephant in the room: sometimes it's annoying or just plain tough to adopt a new product. Especially when you need to get your entire team up and running ASAP to meet your monthly sales goals. If you prefer video content for learning how to configure your settings after you've reached your Dashboard, scroll to the bottom of this page. When you click the Activate Account button, you will be brought directly to your Profile Setup. Just enter your name, and then you can preview your Profile on the right. (Upload a photo if you have one on hand, but you'll be able to do this easily later on too). As soon as you hit Continue to Meetings, you can immediately Connect your Calendar in one click! For the sake of example, I'm going to connect my Google Calendar. A pop up will prompt you to choose an account to sign in with; after entering your sign in credentials, click Allow so that we can see your availability and never double book you! Before installing your Chrome extension you can take a look at all the meeting types you can create and the different calendar settings available. Now that you have connected your calendar, you can start "dropping" your calendar within chat conversations, email signatures, or Playbooks to book meetings!. You also have the option to customize the type of meetings visitors book on your calendar. 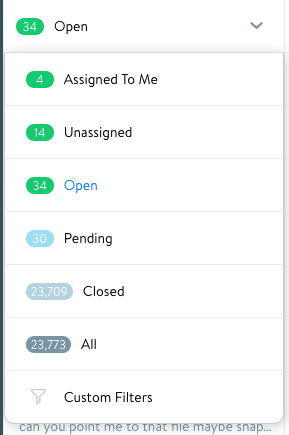 Head over to My Meetings to customize your meetings by selecting Meeting Name, Length, Link (the url at which a user can book that specific type of meeting), Location, and Description. When a visitor clicks the Schedule a Meeting button on your Drift profile, they will be shown time slots for your Default meeting type. To allow your clients to book one of the other new meetings that you customized, you need to place the meeting URL in your playbooks, email signature, or drop them directly within conversations. Under Calendar Settings you can find Buffer Time, which is the amount of time you would like to set between meetings. This is really useful for those calls you suspect may run long or to give yourself a breather! You can also choose a Minimum notice time, which is the minimum amount of time a lead must give you before they can schedule a meeting with you. For example, if you have a 4 hour minimum notice time, someone who tries to book a meeting with you at 12 pm won't be able to schedule until 4 pm or later, provided you have that time available! 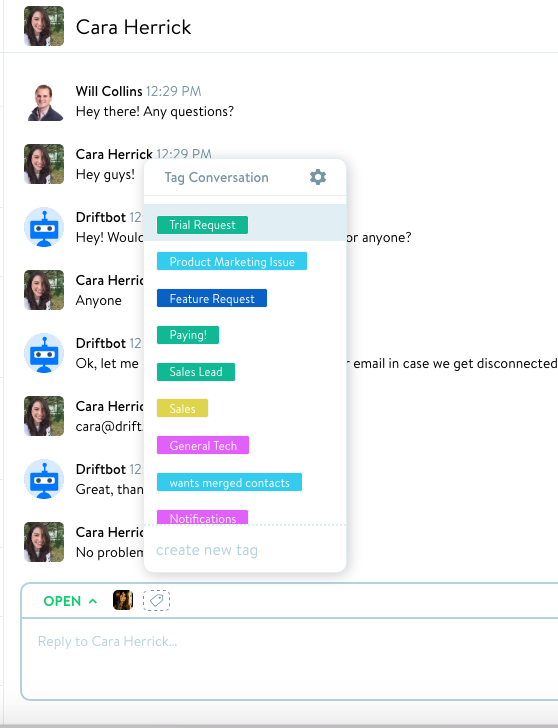 Finally, you can connect your Drift Assistant to automate meeting prep and follow-up. You can even customize your meeting confirmation and meeting reminder messages that your guests will receive! You have a high degree of control of your calendar settings as they pertain to meetings. Here you can find Buffer Time, which is the amount of time you would like to set between meetings. This is really useful for those calls you suspect may run long or to give yourself a breather! Next you'll be prompted to Install the Drift Chrome Extension. Takes 10 seconds, and is a super easy way to start following Leads and jump into conversations. If you accidentally skip it you can always add it later by clicking this link. This is what a conversation will look like from a customer's POV. On the left, you'll see that all new conversations come through in life time. When someone "unknown" starts a conversation, they'll be shown as a "Site Visitor." Once they enter their email address, we'll enrich the data on the customer to give you a more robust understanding of who they are. 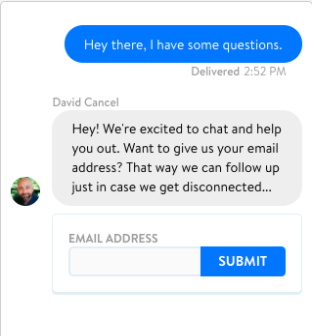 You can ask for someone's email address at any point in the conversation (even outside of the email form!) and it will update in their profile. You can also edit which attributes are shown on the right from any customer's profile. Changing the conversation status is the primary way to organize your chats. Ideally, you would keep all new, active conversations in their "Open" state. Any chats that require follow-up or are incomplete for some reason should be in "Pending." "Closed" status speaks for itself. Whenever a conversation is over, change the status to "Closed" and it'll go into the closed queue. A conversation won't ever be entirely deleted, it'll remain in the customer's profile timeline. If they continue the conversation, it'll reopen and come through the "Open" queue. 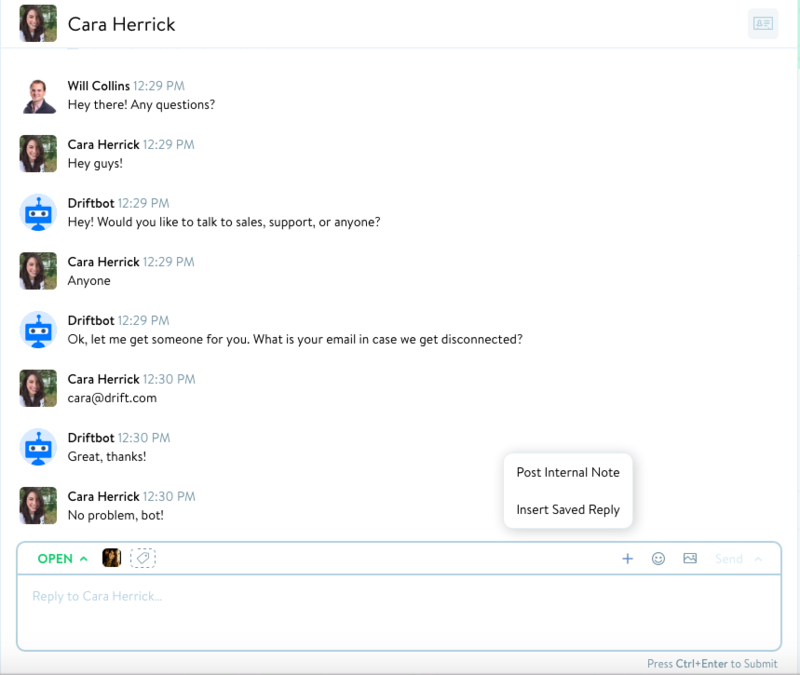 If you're using the Salesforce integration, a conversation is only logged when you close it. Make sure to close 'em out when you're done! Rep status is important to understand as a team, in order to organize who's responsible for new chats coming in, etc. 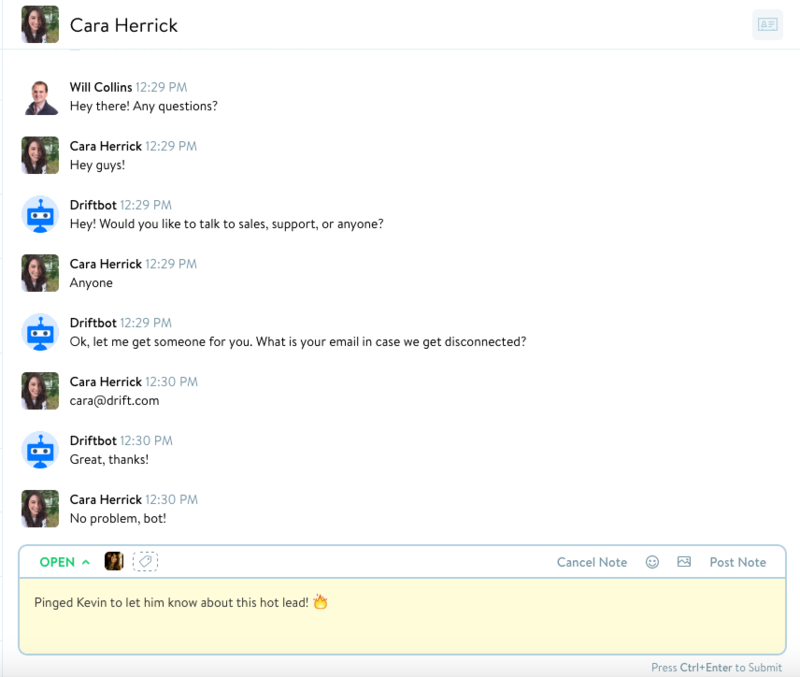 If you use lead routing, you’ll only be automatically added to conversations when you’re “Active”. You won’t be added to any conversations when you’re “Away”. That’s it! When a conversation comes in and no one is in the catch-all rule, the conversation will go unassigned. These conversations will exist either in the "Open" or "No Participants" queue. 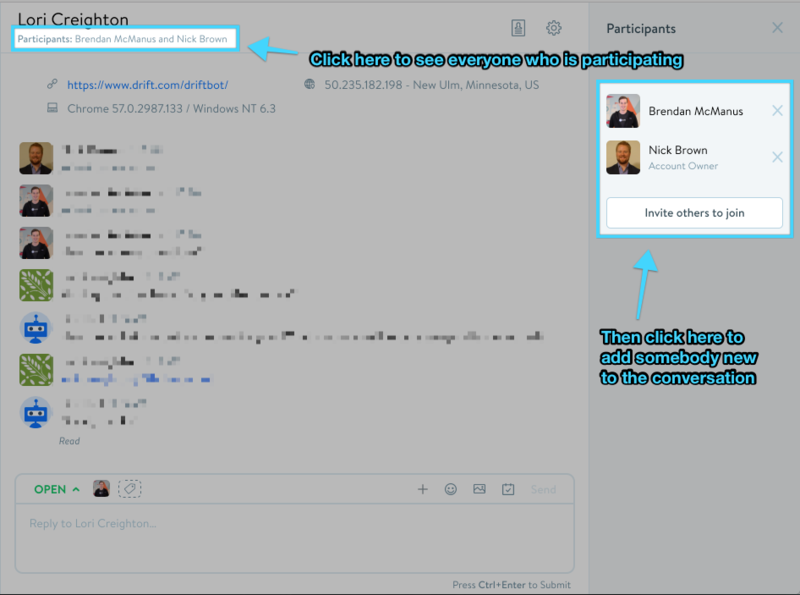 If you want to add another participant from you team to join the conversation, you can do so right in the view! You can also remove other team members from the conversation in this view as well. As you can see above, there are several different conversation queues. 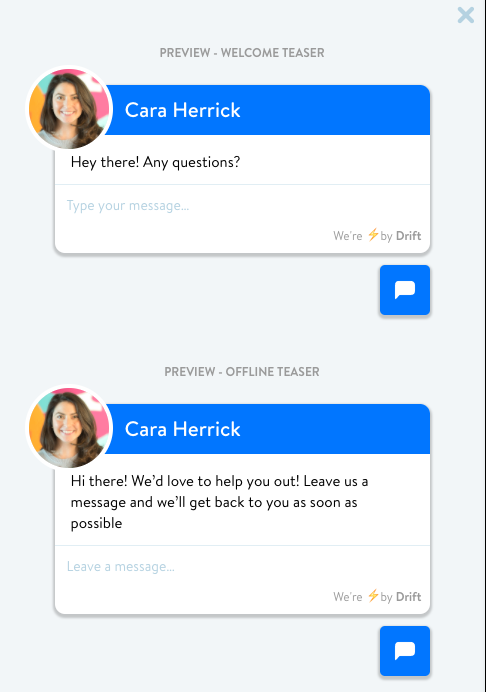 All new conversations can always be found in "Open." If there's one person in the catch all rule, operate out of the "Open" queue. If there's more than one person in the rule, operate out of the "Your Conversations" queues. This will keep reps from stepping on each others' toes. 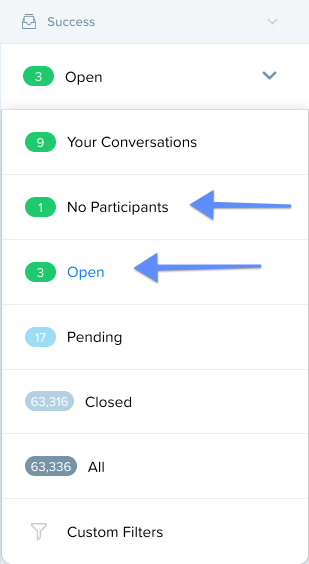 If you have a lot of bots running, where technically there are no participants in the conversation, then always check the "no Participants" queue and make sure every conversation has a participant. No lead left behind! You can customize your notifications under My Settings > My Account > Notifications. These settings are at a rep level, so each person can adjust them to their liking. You can be notified in 3 ways: Email, Browser, and Mobile. Recommendations: Only set notifications for conversations assigned to you. If there's always someone monitoring incoming chats in the app, there's no need to be notified whenever any new conversation is started. Email fallback is a feature that allows for conversations to be continued, even if a customer leaves the page. 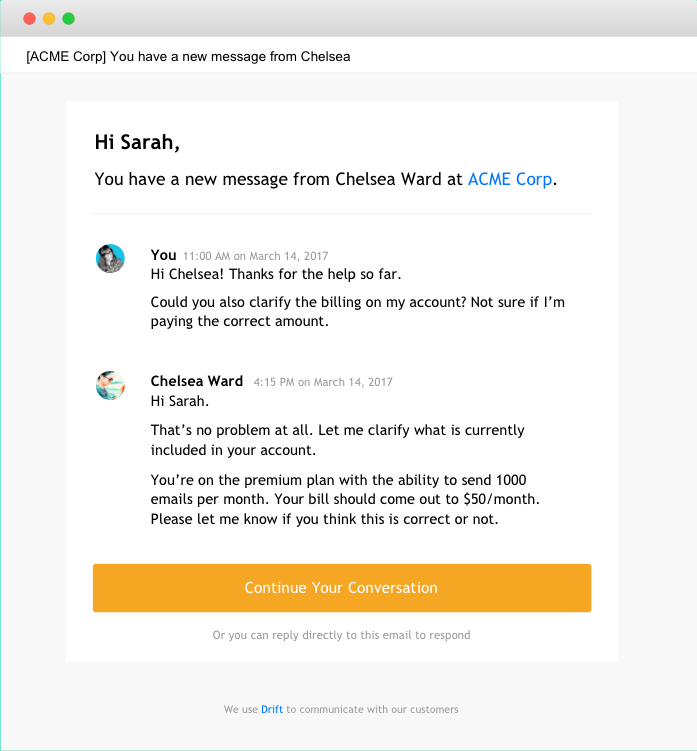 The customer can then either respond via email to continue the conversation (it'll continue in the same thread) or they can click on a link that will take them back to the website page. Tagging is just another way of organizing conversations. We use it for a variety of different reasons, including marking new leads, feature requests, bug reports, follow-up required, etc. It's really up to you to create a system that works best for the team. The beauty of tagging is that you can filter based on them. For example, if I wanted to view all conversations with a "follow-up required" tag, I can filter and then work through the list on its own. These are great to use as a quick way to answer common customer questions. If you click on the + sign in the conversation view, you'll see the option to enter a saved reply. To configure your saved replies, go here. Internal notes are a great way to communicate the state of a conversation with your team, or just a way to make a note for yourself later. For example, if I have a customer who wants more information on pricing and we decide to take it offline, I can make a note that we have a call. Or, if someone wants to follow-up with a customer, notes are helpful to know the last action taken on someone's account. 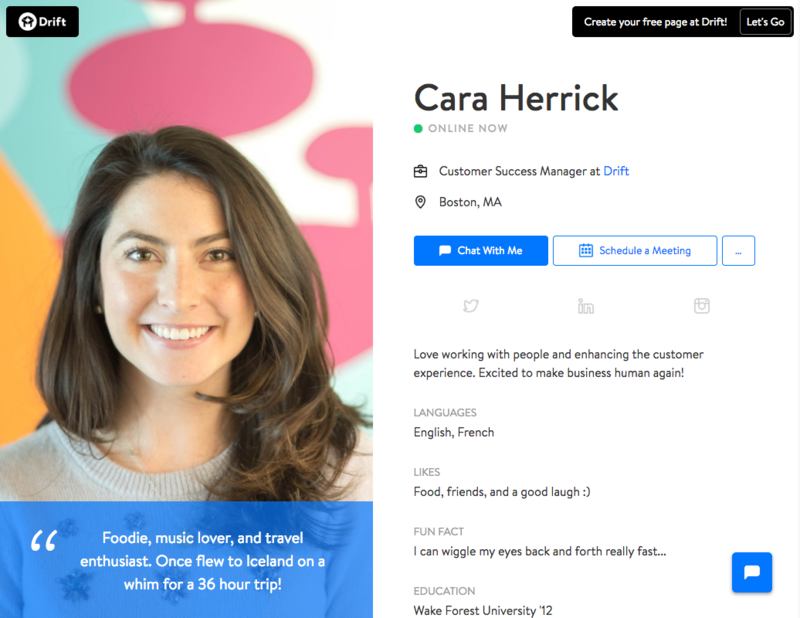 A customer's profile is a complete timeline of any event that has happened via Drift (and some native integrations). You'll notice that you can send a message directly to someone via their profile, or you can "follow" them. What this means is that you can be notified whenever a customer is on your site. 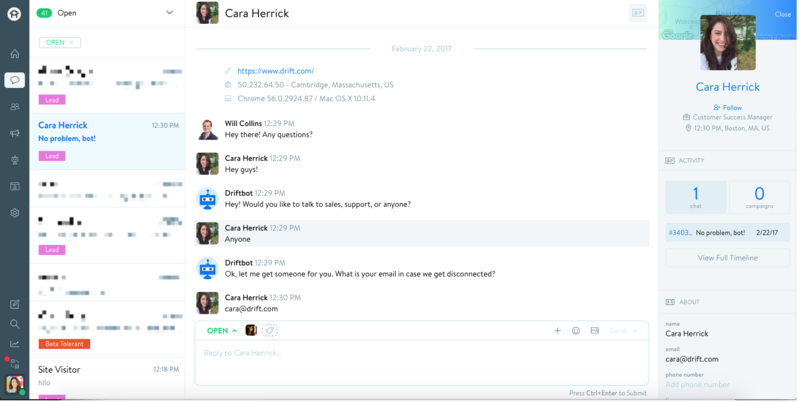 So if you have a big customer who you're working with, this is a great way to reach out to them via Drift, at the moment they're most engaged. See that "Edit" link next to the "About" section? That's where you can pick and choose which attributes you want showing in the Conversation view. Visit my actual Drift Profile here! Want to get more leads without really having to do... anything? Well, now you can easily provide someone with a link to your Drift Profile and they can book a meeting with you directly on your calendar. They can choose a day and time and you'll both get an invite. 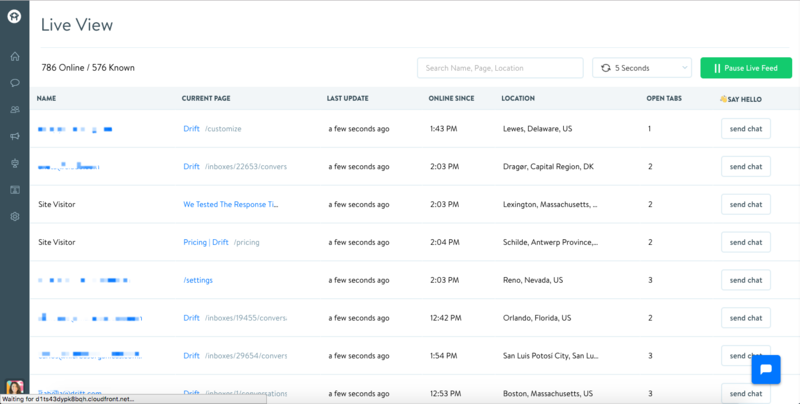 Live View is a tool that allows you to see a live feed of identified customers, as they're on your site. This is another way to proactively message leads or customers while they're most engaged and high intent. 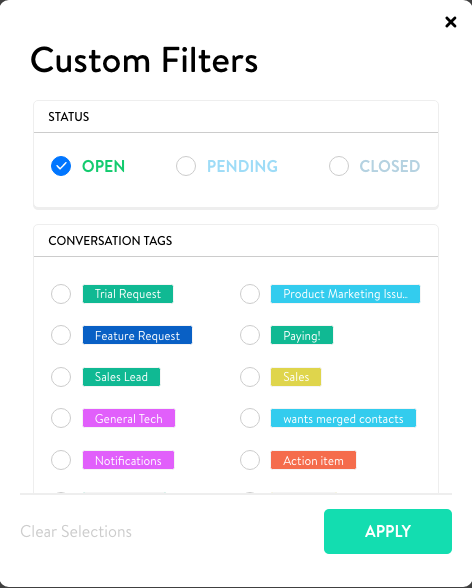 You can view what page an identified customer is on and tailor a unique message to them at the optimal point of contact. Close deals from your Uber! We have native apps for both iOS and Android. So that's a good place to stop for onboarding on a rep level. 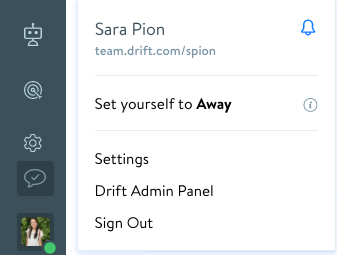 You can manage your team and invite them to your Drift account here. Once they receive the invite email, they can go through the signup steps on their own. You can customize any aspect about your Drift widget by going . You can set your hours and availability, manage the online/offline messages, set your colors, etc. all from here. 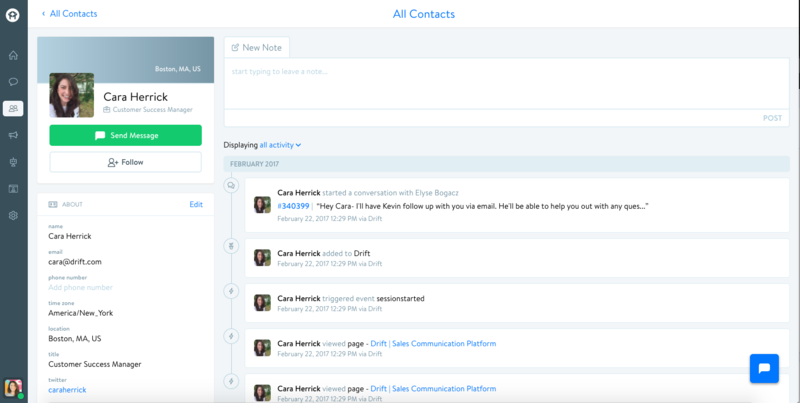 Setting up integrations is the best way to build Drift into your existing workflow, you can setup your Salesforce integration, knowledge base integration, or use Zapier to build almost any other integration you might need. Check out Conversational Marketing University for a bunch of helpful videos to get you through setitngs!